Thank you everyone who submitted resolutions to the Connecticut State Grange Annual Session. We had a nice variety of topics to discuss . We ended up with 32 resolutions covering to pics including environmental concerns, Grange processes and safety concerns. One resolution topic, which is time sensitive, was resolution number 5, Sale of State-Owned Real Estate and resolution number 17, Public Notice and Public Hearing for Public Land. Both of these resolutions covered the subject of the Referendum Question 2 which is appearing on the upcoming November election ballot. Referendum Question 2 concerns state owned lands being sold, swapped, or given away without public input. If Referendum Question 2 passes, the State would be required to hold public hearings before any state-owned public land such as state parks, forests and agricultural lands can be sold or transferred. Presently the State can sell or transfer lands without any public notification. The committee combined the two resolutions into resolution number 26 which was then supported by the delegate body. We had one resolution concerning banning the use of Round-Up products which contain the active ingredient glyphosate. It was felt that the delegate body did not have an adequate understanding of glyphosate to act on this resolution. They voted to postpone it until next year and asked the State Grange Agricultural Committee to research this and bring a report back to the next State Grange session. Resolutions passed by the delegate body concerning state issues will be incorporated into the State Grange Legislative Guide. This guide will be handed out to all of the Connecticut General Assembly members as well as the Governor and Lt. Governor. 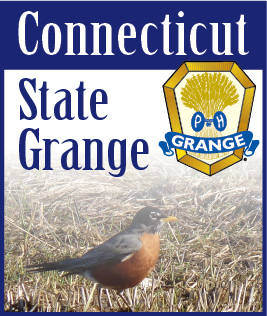 As we now have a new State Grange Pres ident, there are many changes to the state committees . Some members of the State Legislative Committee are remaining. I (Alma Graham) will continue as the Director, Gordon Gibson and Charles Dimmick will also continue as members of the committee. I would like to welcome Noel Miller from Coventry Grange and Sue Masino from Simsbury Grange t o the Legislative Committee. I am looking forward to working with them. I would like to thank George Ward and Russell Gray for all of their hard work and dedication to the Legislative Committee. I know that they are both very dedicated Grange members and we all appreciate all they have done for the Grange. Thank you, George and Russell.